It's time for another "Seavers in the News" post. I found this interesting article today on GenealogyBank and was intrigued by it. I'll tell you why later. "REMARKABLE PRESENTMENTS. -- Last week, Friday, Mr. J.D. Seaver of Stowe, Sheriff of Lamoille county, was fatally injured. It seems that there was a horse trot at Morristown in which he and a Mr. Gilman were parties. Seaver's gig was overturned by his running into Gilman's, when Mr. Seaver was dragged about thirty rods and badly mangled especially about the head. "While at Montpelier last week, we heard some very remarkable statements made in connection with the death of Mr. Seaver as stated above. We give them as we heard them, and can if necessary, name our authority. We understand that for a long time previous to the death of Mr. Seaver, his wife repeatedly told him that death would soon enter their family, and strongly urged him to purchase a lot in the cemetery, upon which it seems, Mr. Seaver had been at work helping to lay it out, &c.
"On the morning of the day on which the above race took place, Mrs. Seaver told her husband that she had dreamed the night before that she saw him thrown from a wagon, dragged some distance and strike his head against something she could not tell what, and was killed. She urged him not to go to the race. He smiled at the dream, not being at all superstitious, and went. He, however, seemed to be not altogether right, and just before the race, told Mr. Gilman that he would much rather not drive, but upon the earnest solicitation of Mr. G. did so with the above result. Mrs. Seaver, upon his departure for the race, dressed herself as if ready for a journey and awaited, as she affirms, to be called upon to go to him. And she was. When sent for she told the messenger before he related his errand that she knew what he had come for. all of which we give as we heard it and pronounce it very strange if true, and we believe it is. -- Vermont Record." 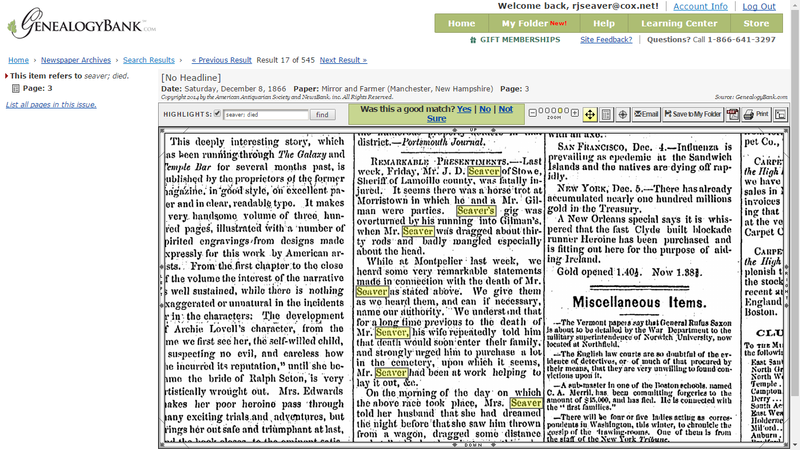 "Remarkable Presentments," Mirror and Farmer [Manchester, N.H.] newspaper, online index and digital image, GenealogyBank (http://www.genealogybank.com : accessed 6 October 2016), Saturday, 8 December 1866, page 3, J.D. Seaver article. 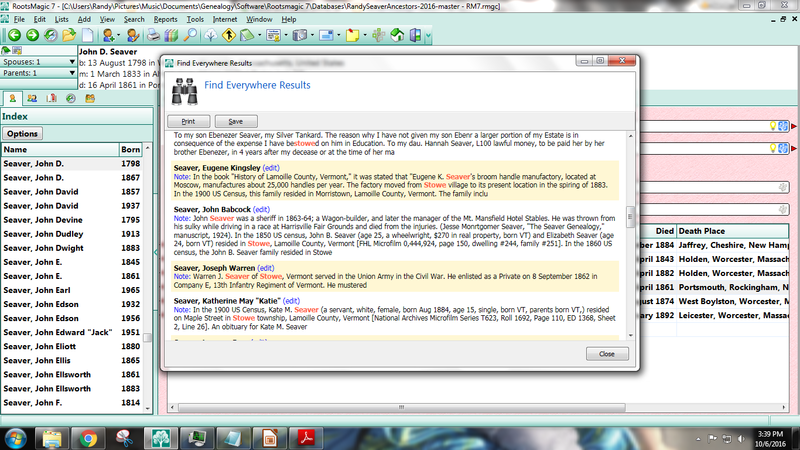 I searched my RootsMagic database for J.D. Seaver who resided in Stowe and was a sheriff. I failed - I looked for a Jacob, James, John, Joseph, etc., with middle initial of D., (and also without a middle initial) Seaver who lived in Stowe and did not find one. So there is a Note for John Babcock Seaver that says "John Seaver was a sheriff in 1863-64; a Wagon-builder, and later the manager of the Mt. Mansfield Hotel Stables. He was thrown from his sulky while driving in a race at Harrisville Fair Grounds and died from the injuries." The death record I had for this man was 1866 from the "Vermont Vital Records, 1760-1954" on FamilySearch. I think that is him. It's strange that the newspapers could not get the middle initial right, but D does sound like B. This article was in the Manchester newspaper on December 8, and the Friday the week before was 30 November, that may be the date of death. But this is a reprint from a Vermont newspaper which may have been published weeks or months previously. So I don't know the death date yet. I will look for another article about the event and see if it has a more definitive date of death.